HH and the Boys: We're playing Tag today. The boys and I were tagged by my pal Brian. And, the boys were tagged by Caren and Cody of Cat Chat. So, we are definitely IT. 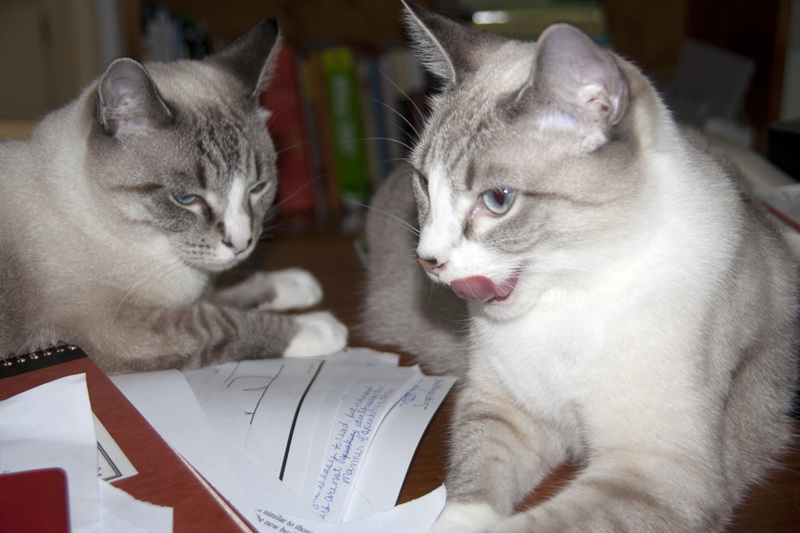 And Caren and Cody of Cat Chat are great friends too. Caren was one of the first to volunteer to review my book. That really gave us a boost. 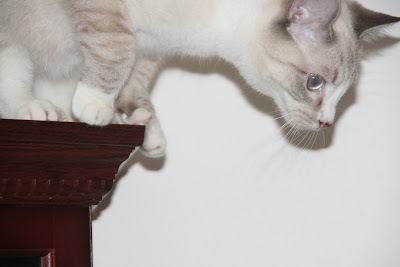 If you haven't been to the Cat Chat blog, go over and visit. There are all sorts of things going on over there ... helpful information to make your life better. Upload a picture of wallpaper you are using at the moment. 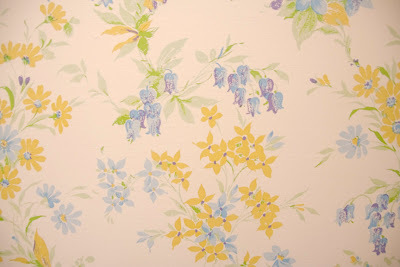 We don't have pretty wallpaper on the computer, but here's a picture of the wallpaper in the bathroom. Bugsy and Knuckles are trying to peel it off the wall... They are making progress. None of us eat chicken. Oh, I take that back. HH does eat a little chicken now and then, but she's a human bean. Bugsy and Knuckles don't eat it at all. And I had some a long, long time ago. The song(s) you’ve listened to most recently? We're not all that hip when it comes to music. We're at the mercy of HH who does like to listen to Leonard Cohen.... and Nora Jones... Is that hip? As I said we don't have a clue. What were you thinking when you were doing this? Bugsy and Knuckles were plotting their next attack on the window to Bird TV. Me... my mind was blank. My nicknames are Sweet Pea, Love Bug, Max-o-million and Big Boy. Bugsy and Knuckles' nicknames are Baby Boy and, of course, Double Trouble. Tag 8 blogger friends (tag you’re it)! Sammy, Andy and Shelly... Now, I have known Sammy and Andy for a while, but am getting to know the new kitty at their house, Shelly, pretty quick. Their mom, Judi, made the header for my blog. Simba is a loyal visitor to my blog. We all love it when he visits cuz he always has something witty to say. I met Madi in the blogosphere. I was first attracted to her by the many license plates listed on her blog. Once we started visiting her, we were hooked cuz she's a good friend. The Florida Fur Kids are neighbors... well not really in the same actual neighborhood, but they are from Florida too and are close enough that they listen for the boomies when the space shuttle returns just like we do. Marg, I just want to say to keep up the good work, Marg. You do such wonderful things for your inside and outside pets. Leave a lovey dovey message for number 2. Yep... they both have great blogs and I visit Oz and The Island Cats everyday. There, wasn’t that fun? If I tagged you, you’re it! Those are some great answers. We really liked them. Thanks for tagging us. We will have to write down the questions so we can answer them. This should be tons of fun. We will pick one or two to do this. Have a great week. Mom loved the wallpaper answer - it made her snicker!! Cool answers pals. Loved the wallpaper! he he - that's about all we know about wall paper too. Very interesting things about you! Super cool! That was a lot of work for you! We are laughing at your wall paper! What a cool post......we are always happy to learn more abou8t our friends. Thanks for tagging us.....we hope to get mama to do our post soon. Good take on the wallpaper! LOL! Also, we found it quite funny that Bugsy and Knuckles are "making progress" in peeling it off. That was a fun tag! Good job boys on tearing off your wallpaper! Hi Guys.....what fun we so enjoyed your answers too!! Mom and I thank you for tagging us. She is back to normal now wo we'll start working on this fun post very soon. I enjoyed reading all your answers! Wallpaper sounds cool - I will have to get my human to put some up so I can shred it. That was great!!! I totally loved the wallpaper, I'll try ripping some just for you guys! Awwwww these were some GREAT answers!!! We loved learning more about you! Thanks for the kind things you said about us and my Mommy loves Nora Jones too! That was really fun, Max!! We enjoyed reading your answers!! And thanks for tagging us! Now we're IT!! We'll get our mom to help us play along soon.